This time we have a Flowers and Bows Theme. Use flowers or buttons along with bows on your project. This challenge is being sponsored by The Paper Nest Dolls. One lucky randomly selected winner will receive a $25 gift certificate for The Paper Nest Dolls shop. How cool is that??!!!! 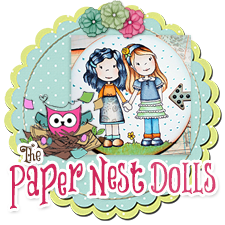 The Paper Nest Dolls are a collection of original artwork, all done by hand, and then turned into a digital or rubber stamp. Each one is unique and special, and was inspired by one of our children. I selected Bubblegum Emma (digital stamp) for my project and she is just adorable. My Copic coloring skillz are not as good as the other gals because I don’t have much time to practice, but these images are so easy to color that even a beginner like me can be successful. I added two double-loop bows using Apple Green Delicate Stitched Satin using my Bow-it-All Tool and I topped the bows off with pretty Pink Open Roses. Here is a peek at the inside of the card. I added a little strip of the pretty striped design paper at the bottom. Love the way your bows echo the hair ribbon. Such a great job of coloring and such a cute card!